Last night, in SF’s South Park neighborhood, CEO Mike Walsh of Leverage Software gave me a quick tour of their “People Map” feature, which is part of their white label social networking suite. 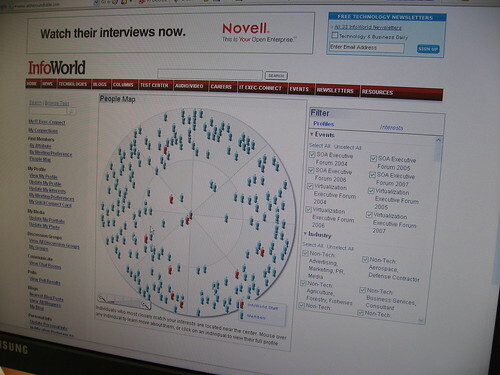 This features looks for implicit metadata of a community and finds people ‘like me’ and organizes them on a 2D map. This can help prospects find customers, sellers find buyers, and single find other single folks. As you can see if you zoom into the map, there are different criteria filters to select for the right match. I’ve been looking at other network based recommendation engines, leverage is the first that I’ve seen that offers this as part of the suite (I’m sure there are others, leave a comment if you know of others). See this list of companies that provide Behavioral Recommendations and Social Recommendations Web Services. You can see Leverage’s other features on their site. To me, the first wave of the web was computers finding information for users, now we evolve to add human recommendations (social web), I hear, but don’t fully embrace that the next version of the internet will be the semantic web. What was interesting is a friend’s son of the company created this image below, an artistic rendition of the PeopleMap features (see first pic below), uncanny likeness! Also, as fate would have it, Kate Swanson (Guitar Heroine below) is a high school classmate.